•Study your hunting area on Google Earth. Jacobsen looks for timber on north slopes with meadows, clearcuts, old burns or other open feeding areas nearby. Then he ground-truths those spots before the season and looks for cows, because he knows bulls will follow them in September. •Keep the wind in your favor, and make the bull expose itself to get downwind from you. Scent killer might help in some situations, but it won’t overcome the wind at your back. •Be sidehill or downhill from a bull you¹re trying to call in. Walking uphill puts the bull at a disadvantage. He knows it, and it will make him less likely to move toward your calling. •Get away from roads. Jacobsen said most of the elk he kills are within a few miles of a road, but hiking at least a mile away from a road gets you away from the majority of other hunters. •Stop the elk. If a bull is within bow range but still moving, use a soft cow call to stop it before taking a shot. •If you bump into a cow while stalking a bull, try to use it to your advantage. Put yourself between the cow and the bull and bugle like you¹re another bull stealing his cow. •Carry only the essentials on your hunt. Jacobsen competes in triathlons to get in shape for elk hunting, but he limits the weight in his daypack to about 12 pounds so he can go fast and light. His daypack includes food, water, knives, matches, game bags, etc. •Skin the animal immediately and get it cooled off. Have a plan in advance to care for the meat so it’s kept in the best condition. Corey Jacobsen, a six-time world champion elk caller, has killed a bull in Idaho every year since 1996. And he’s willing to share how he does it. Only 20 percent of Idaho hunters bag an elk during the fall seasons. Jacobsen’s streak is even more odds-defying considering he hunts on public land during general archery hunts and doesn’t use pack animals. His formula calls for thorough preparation by scouting and knowing his hunting territory, being in good physical condition and mastering a few basic elk calls. Jacobsen uses three basic calls for hunting: a locator bugle, a cow call and an aggressive fighting bugle. His strategy is a hybrid of traditional calling and spot-and-stalk hunting. He climbs high on ridges and listens for a bull to answer his locator bugle. Once he pinpoints a bull, he quits calling and begins stalking. “We go to the bull,” he said. Keep quiet and keep the wind in your favor as you approach the bull. You’re not just trying to get close to the bull, you’re trying to set up an ambush so the bull will approach within bow range when you resume calling. Try to find a spot where there are clear shooting lanes yet terrain isn’t so open the bull will be able to see the caller. Use a range finder to measure several spots where a bull is likely to pass through and memorize those distances. Set up in front of brush or other cover and let your camouflage do its job. Setting up behind cover limits shooting lanes. After the stalk and setup, it’s time for teamwork. The caller moves back about 50 yards and the shooter “vanishes from sight and sound.” The caller makes a few mews to imitate a cow elk. If the bull answers, things get wild. Rather than waiting for the bugle to end, the caller abruptly interrupts it. In elk language, they’ve just called the bull a nasty name and insulted its harem as well. Some bulls charge right in. However, if the bull stays put, a live-action chess game begins as the hunters try to force the bull’s next move. They will repeat the cow call and again cut off the bull mid-bugle in an effort to provoke a fight. The goal is to make the bull react to your calls, not the other way around. If the elk still doesn’t want to play, the next step is raking a tree, which is a way elk show dominance. “We keep that calling sequence and throw in raking,” Jacobsen said. Don’t just call like an elk, think like an elk. If the bull still doesn’t commit, Jacobsen and his partner continue their psychological warfare by posing as two other bulls. They spread out and start aggressively bugling to each other, ignoring the real bull. As the conversation between the two hunters gets heated, they move in the direction of the bull, trying to invade its territory and pull it into the fight. The bull’s curiosity and testosterone may prompt it to head toward one of the callers. Not every situation will go by the playbook, Jacobsen said. You will inevitably face challenging situations and make mistakes, but use them as learning experiences for your next hunt. 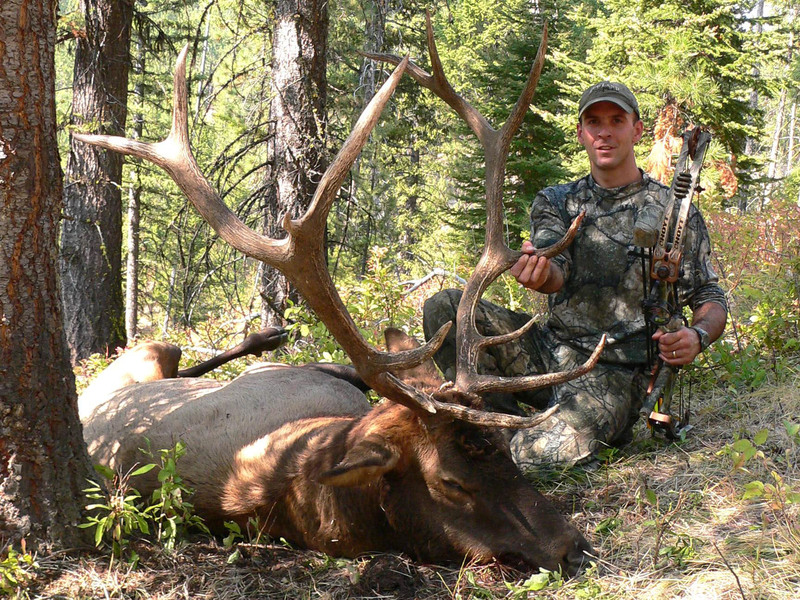 Corey Jacobsen’s elk hunting strategy is spelled out on his Web site: elk101.com.